This is a quick tutorial covering how to clear your SPD 2013 Cache. That is handy, especially when working with SPD 2010 and SPD 2013. This is a quick tutorial covering how to clear your SPD 2013 Cache. That is handy, especially when working with SPD 2010 and SPD 2013. Clearing the cache will remove any of your past connection history as well provide you a “clean slate” to work from. The cache is not even cleared after doing a reinstall, so this really is the only way to clear it. Versioning with check-in/out are great but not always preferred, and certainly not infallible. As I learned on a project a few years ago that recently bit me again when my new machine was not similarly configured, SharePoint Designer has a dirty little habit of caching files, including say the XML/XSLT, JS and CSS you might be working with on your site. No need to fret though; buried in the settings of each version is a toggle that will ensure SPD never sets you back by loading a cached file. Navigate to the "File" menu then select "Options" -> "General" -> "Application Options". 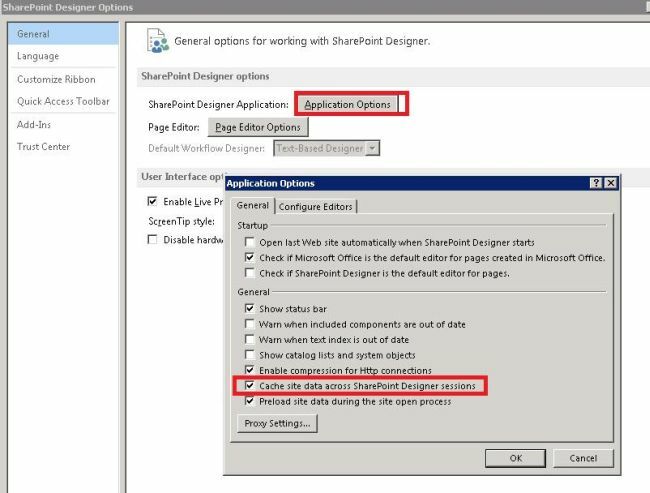 On the “General” tab, under the “General” heading, uncheck “Cache site data across SharePoint Designer sessions”. This is a quick couple of steps for clearing your cache and to hopefully resolve SharePoint Designer anomalies that present themselves from time to time.